What a great start it’s been to 2016! As all of you probably know by now, we received the biggest gift in Florida State University history just before winter break. 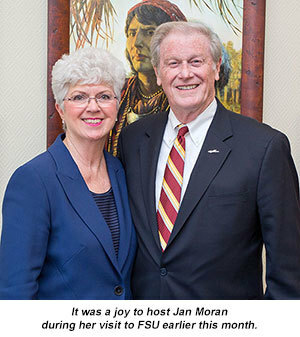 The $100 million gift from Jan Moran and the Jim Moran Foundation — the largest to any Florida public university — will create the Jim Moran School of Entrepreneurship. This extremely generous gift will allow us to nurture FSU’s great entrepreneurial spirit not just in the College of Business but also across every discipline on campus. It will create so many new opportunities for students and faculty. Gifts of this magnitude don’t just happen. They take a lot of work by a lot of people, and I’m especially grateful for the leadership of Vice President for Advancement Tom Jennings as well as College of Business Interim Dean Mike Hartline and Executive Director of the Jim Moran Institute for Global Entrepreneurship Randy Blass, for helping to make this happen. I was so happy to thank Jan Moran in person when she came for a campus visit earlier this month. It was my pleasure to introduce her to so many of our innovative students and faculty — she knows she has invested wisely in FSU’s future! I’m also thrilled that FSU Trustee Susan Fiorito, chair of the Department of Entrepreneurship, Strategy and Information Systems in the College of Business and president of the Faculty Senate, has accepted the position of founding director of the new school. Susan’s energy, enthusiasm and business sense will be great assets as we launch this endeavor. And, last week, we got more exciting news! FSU Trustee and alumna Kathryn Ballard and her husband, Brian Ballard, donated a building valued at $1.1 million in downtown Tallahassee that will serve as home for the new school and will be the physical centerpiece of our “entrepreneurial university” initiative. The Monroe Street building is in a perfect location — within walking distance to several downtown businesses and the Capitol, yet still close to campus. We’re only halfway through the spring semester and already it has been jam-packed with big events. It was FSU’s turn to host the Florida Board of Governors for its meeting in January. The BOG, along with the 12 state universities, announced a new campaign — “Think Florida: A Higher Degree for Business” — to promote further collaboration in the areas of talent, research and partnerships with the state’s business community. It was nice to see some of our top-notch faculty on hand to support this effort. 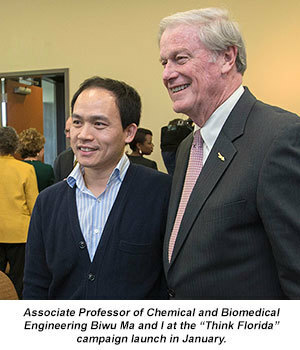 I know that FSU’s cutting-edge research will continue to draw businesses to Tallahassee and the Sunshine State. FSU Day at the Capitol is always a wonderful opportunity to showcase the excellence that has led to our designation as a preeminent university. There was a lot of Seminole pride on display Feb. 2 as the Capitol was decked out in garnet and gold for the day. I’d like to thank all the faculty, staff and students who staffed the tables on the first three floors. Those exhibits were a great way to let legislators and visitors know about all the important work going on in our colleges and research centers. The video below will give you a flavor of the event. Today, I'm excited to go down to Sarasota to get a sneak peek of the new Center for Asian Art in the Dr. Helga Wall-Apelt Gallery of Asian Art at The Ringling — one of FSU's great partners. With the arts and cultures of Asia continuing to grow in importance, a center devoted to their study is critical to our job of educating future global citizens and introducing them to the marketplace of ideas. We will officially open the center with a grand community celebration May 15, and I hope you get a chance to visit the beautiful museum in the coming months. Closer to home, I encourage you to check out the Cuban Art in the 20th Century exhibit at FSU's Museum of Fine Arts before it closes March 27. Curated by one of our own doctoral students, this exhibit rivals any that you would expect to see at a large metropolitan museum. In fact, it is the largest exhibition of Cuban art shown in the United States in the past 70 years. In the coming months we hope to finalize the university's new strategic plan and establish a vision for the future. I want to thank everyone who has participated in the process so far. Keep updated at strategicplan.fsu.edu. Florida State is on the rise — and all of you play a big part in our success. 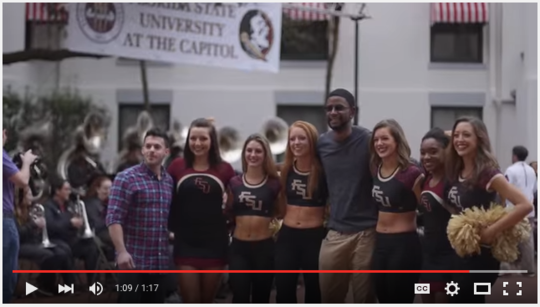 Every day, you are generating positive media attention for FSU, and I’m pleased to share some of those clips below. Your ideas and feedback are important to me — and always welcome.